The Chicago Riverwalk and the Chicago Park District’s Eleanor Boathouse at Park No. 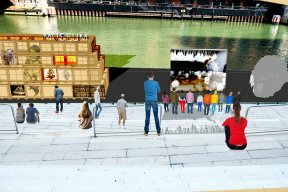 571 are welcoming a temporary riverside exhibition by the Floating Museum, the collaborative arts organization that creates temporary, site-responsive installations to activate sites throughout Chicago. The interactive spaces engage artists, historians and organizations in events that think outside the museum and generate community conversation. The summer exhibition River Assembly starts August 7 at the Eleanor Boathouse in Chicago Park Districts’ Park No. 571 (2828 S. Eleanor Street) and will remain on view through August 13. 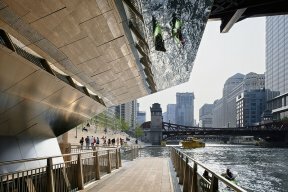 The barge will then travel along the river to the Chicago Riverwalk (at the River Theater between LaSalle and Clark Streets) where it will dock for two weeks from August 14 to August 28, when it will move on to Navy Pier. The installation is open daily, and admission is free. A full schedule of programs is available at thefloatingmuseum.com/calendar. © 1426 Chicago Hispanic Newspaper, Lawndale News, Hispanic Bilingual Newspapers, Su Noticiero Bilingue. All rights reserved. XHTML / CSS Valid.